A California judge is endangering 2,551 migrant children by rushing their reunification with migrants who claim to be their parents, says the Department of Health and Human Services. The discovery of fraud and deception among the adults who brought the first batch young 103 children shows that the “truncated vetting for [2,551 children aged 5 to 17] would result in HHS placing up to approximately 175 children with adults who are not their parents in the next 13 days,” said a July 13 court statement signed by Chris Meekins, a senior official in the DHHS agency. The statement flips the claim by progressives that President Donald Trump is endangering children by separating them from their migrant parents. Trump’s deputies are now pointing out that a rush reunification carries risks for the children which progressives are claiming to champion. Judge Dana Sabraw has set a July 26 deadline for reunifying all of 2,551 children and youths with the migrant adults who brought them into the United States. 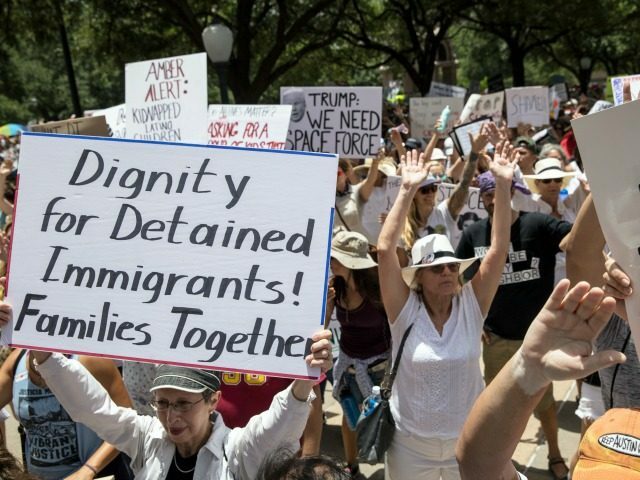 To ensure the unification, the judge is requiring that the adults be released from detention via the catch-and-release loopholes which President Donald Trump is trying to close, even their claims for asylum have not been decided.